I’m working on a project that requires two power strips to be turned on in a sequence. The first power strip powers 6 HDMI displays, and the second one powers 6 computers. The displays have to be on before the computers so they sync properly and get the correct resolution. Since I can’t rely on a person to do this properly, automation is the answer. My first thought was to use something like a PowerSwitch Tail with a microcontroller to trigger it. (There’s also a cheaper kit version available.) The issue with this solution is that I’d need a microcontroller, and a power supply for the microcontroller, which are more parts, and more points of failure, and take up more space. 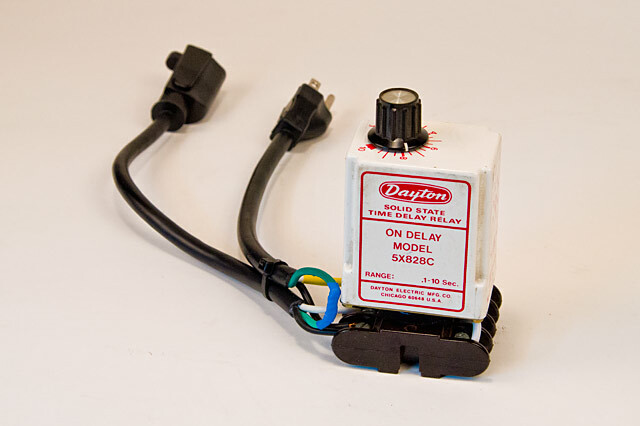 I also considered using a cheap relay module, but ultimately I was overly complicating the whole thing. Also, I want this to be reliable, and sticking a 5v power supply, a microcontroller, and a relay in a box for three years seemed a little risky. What I really needed was a “Time Delay Relay” which is a device that can get power, wait X number of seconds, and then power on another thing. There’s a whole bunch of them you can just buy! Time Delay Relays are not cheap though… This one is under $40, but you’ll probably also want the socket, which puts you closer to $50. Luckily, Milwaukee Makerspace is filled with all sorts of old industrial “junk” and we have a bunch of these sitting on a shelf! Brant (you know, the guy who made an Auto-Off Timed Outlets from an old microwave control panel) helped me find one and get it wired up last week. It works great! I used a $3 extension cord to provide an easy way to plug it into the first power strip and plug the second power strip into it. There’s a dial that lets you set the delay up to 10 seconds, which is more than enough for my needs. If I’ve learned anything from this project it’s that even though you think you might have a good solution to a problem, it’s still worth asking others (at the space or on the mailing list) because you may get a better solution, and may even get the parts you need. 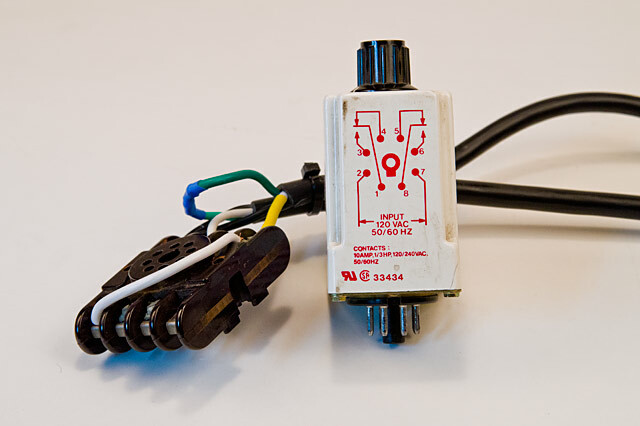 This entry was posted in electric, electronics and tagged delay, power, relay. Bookmark the permalink.